Walking into any library’s Youth Services Department should be a welcoming, engaging, and fun experience. At the Deerfield (IL) Public Library, we are fortunate to have two large glass cases that house displays of our own making and, more importantly, artwork from our community. Our in-house displays promote just about every aspect of Youth Services, from books and other materials to programs and Summer Reading. Displays from the community send the strong message that our library is a proud partner with many local organizations. On those rare occasions that the cases aren’t housing a community display, we create our own! Typically we’re responsible for displays over the summer, as well as in September, when it’s too early for the schools to have enough artwork. Regardless, it’s great fun to put our own artistic abilities to the test. If you don’t have glass cases, think about other spaces available to you. We create displays on the front of our service desk, on the freestanding slat walls, or on the octagonal displays scattered throughout our department. Sometimes those displays are interactive for our young patrons, with lift-the-flap questions and answers, voting slips, or sticky notes. Those are some of my favorite to create! 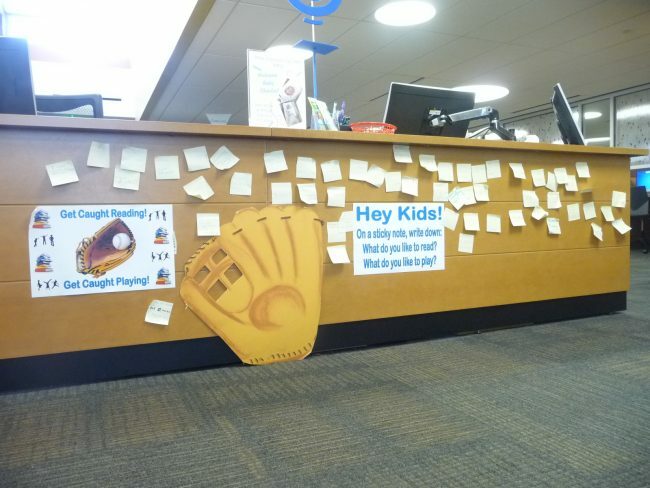 It might be as simple as the Get Caught Reading display, where we asked children to write on a sticky note their favorite way to play or favorite book to read. A display I called “ASK: Acquire Some Knowledge” featured lift-the-flap questions such as “Where is the tallest building in the world?” and “What is the fastest land animal?” It’s rewarding to see children using the books on display to ponder the questions and then lifting the flaps to get the answers…or perhaps just lifting the flaps right away! Two displays this year coordinated with our Summer Reading Program theme “Reading Takes You Everywhere.” One showed where in the world our teen volunteers had visited or wanted to visit, and the other highlighted signposts leading to fantasy worlds (all the signs pointed to our department, of course!). 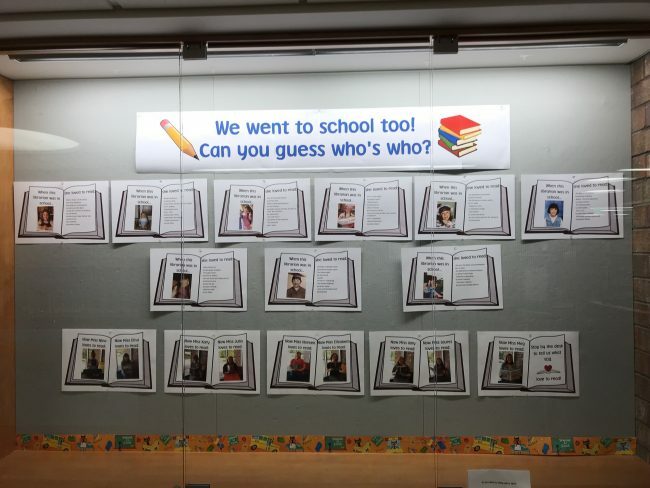 Our back-to-school display featured childhood pictures of our Youth Services staff with accompanying favorite childhood books and encouraged our patrons to try to match those pictures with our current photographs, where we held up new favorites. A lift-the-flap answer key was mounted to the glass door. 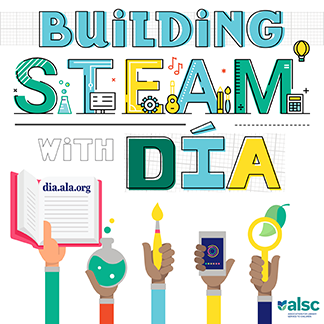 Displays — wherever they are in your department — are a great way to encourage exploration, to educate, to promote books and programming, and to create connections with your community. We’d love to read about some of your favorite creative displays in the comments below. 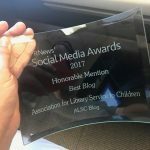 Today’s guest blogger is Kary Henry, the School Outreach Coordinator at the Deerfield Public Library. 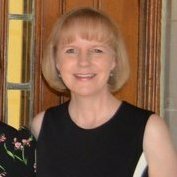 Kary loves her job which encompasses anything with the word “school” in it: preschool, elementary, and middle school outreach, as well as homeschool programming. She can be reached at khenry@deerfieldlibrary.org or on Twitter as @MissKaryReads. This post addresses the following ALSC Core Competencies: II. Reference and User Services and V. Outreach and Advocacy.